New York Yacht Club: (Burgee) - blue, a red cross with in the centre a white five-pointed star. "The club's first annual meeting took place at Windhams Tavern on March 17, 1845, during which the membership elected a full slate of officers. Commodore Stevens was reelected; Vice Commodore was Hamilton Wilkes; Corresponding Secretary, George B. Rollins; Recording Secretary, John C. Jay; Treasurer, William Edgar. 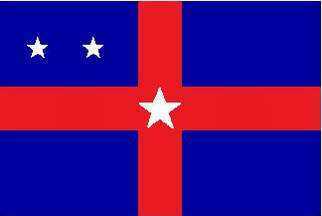 These officers directed the Secretary to design a club burgee, and the present distinctive burgee of a red cross with a white star in the center on a dark blue background was adopted the following June." Judging from the website, currently the burgee looks to be a very dark blue field with a red cross throughout with on its centre a white five-pointed star. It is a dark blue flag divided by a red centred cross with a white 5-point star in its centre. In the canton are three white 5-point stars ordered one over two. 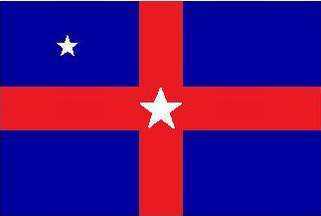 It is a dark blue flag divided by a red centred cross with a white 5-point star in its centre. In the canton are two white 5-point stars ordered in a row. 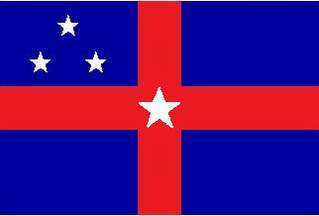 It is a dark blue flag divided by a red centred cross with a white 5-point star in its centre. In the centre of the canton is a white 5-point star. It is a dark blue swallow tail pennant divided by a red centred cross with a white 5-point star in its centre. Rectangle. Same design as burgee with a white fouled anchor bend-wise in upper hoist quarter. It is a dark blue flag divided with a red anchor with rope in its centre. The anchor is flanked by white capitals 'R' and 'C'. Rectangle. 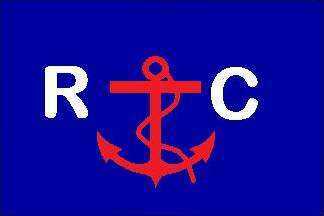 Same design as burgee with a vertical red fouled anchor between white letters R and C in upper hoist quarter. ". . . NYYC Race Committee flag can be displayed when a Race Committee member is onboard a yacht . ."
Sources: Quote (above), NYYC's Curator of Collections, Ms. Alice Dickinson. Other quotes and images, NYYC Yearbook, 2015. Rectangle. Same design as burgee. "A member may display the Member Aboard flag when aboard a yacht not owned by the member . . . [it] shall be displayed from the starboard main spreader only subordinate to a quarantine flag and to burgees of clubs founded prior to July 30, 1844. When a courtesy flag is flown the 'Member Aboard' flag is flown from the port main spreader." Commodore: Broad Pennant: circa 3:5 and 3:3 to crutch (print image). Blue field charged with a white fouled anchor (per bend) circled with 13 white stars. Rear Commodore: same design as Commodore except with white field and red stars. Acting Commodore: blue field only.